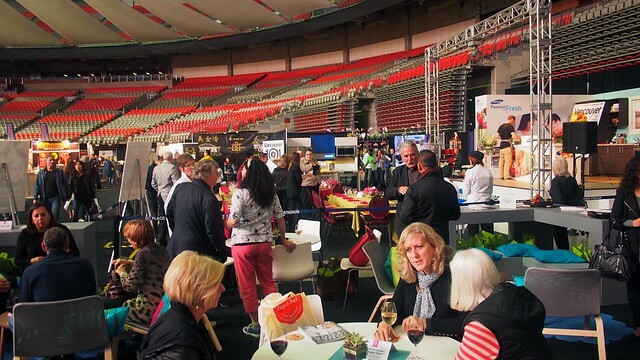 Pop-up dinner party at the 2013 Vancouver Home + Design Show at BC Place Stadium on October 17 (and 19), 2013. 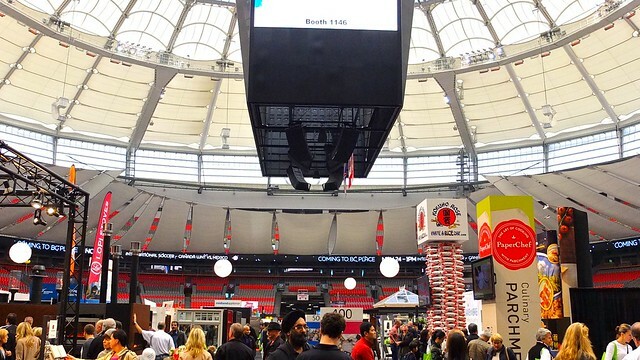 To toast their 30th anniversary, the Vancouver Home and Design show teamed up with Samsung Canada and their Passion for Fresh oven initiative to host a pop-up dinner and tasting menu right on the showroom floor on opening night of the convention. Despite some delays and technical difficulties with the equipment, the chefs and cooks coped and adapted to preparing their special culinary concoctions. 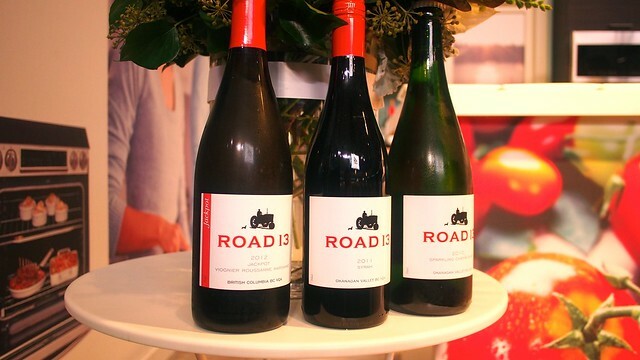 Each of our dishes, specially prepared by a different local chef, was paired by sommelier Kurtis Kolt paired with a fine vintage wine from Road 13 Vineyards. 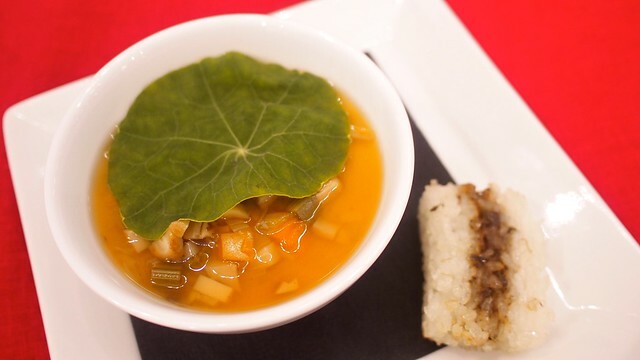 For an appetizer, Chef Curtis Luk from The Parker served us a Chawanmushi soup dish (with celeriac, pine mushroom broth, and yaki onigiri). It had a strange yet intriguing tofu like texture with its egg custard and a rich taste to its broth. Chatting it up before the dinner were Vitamin Daily writer May Globus, Beaucoup Bakery's Jackie Kai Ellis (more on her below), and Good Life writer Cassandra Anderton. 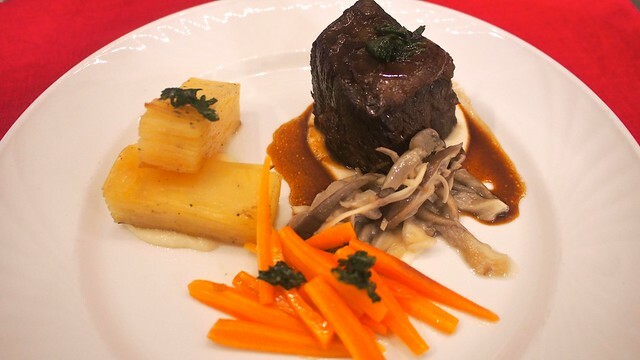 Chef Jeff MacIntosh from Boneta served a tender slow braised short rib (with cauliflower celeriac puree, lemon potato pave, oyster mushrooms, heirloom carrots, and fried parsley). This was a well-cooked, moist, and delicious cut of meat. 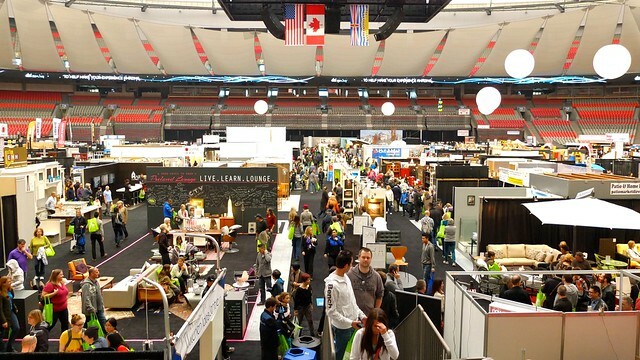 Foodies and fest goers sipped and noshed as the home show emphasized different local top chefs taking centre stage to showcase home cooking. 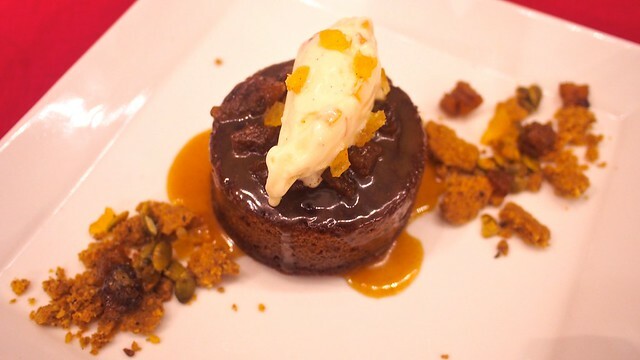 Jackie demonstrated her Parisian baking skills, whipping up some gingerbread cake (with roasted pairs, salted caramel sauce, and spiced ice cream). It was a delightful cake full of spiced flavour and sweetness. It was a nice capper to the evening's dinner as well as the weekend long life and style festivities.